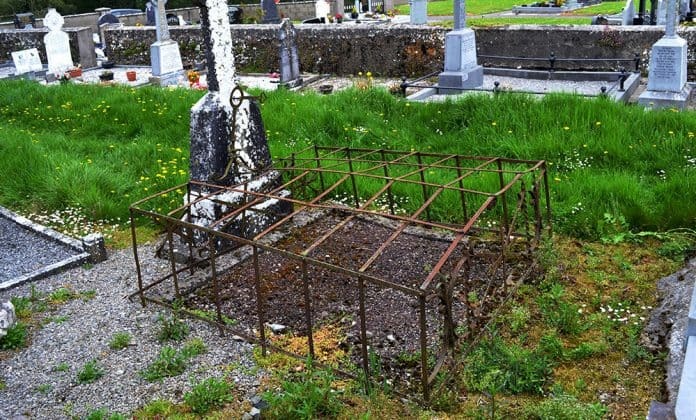 An Anti-bodysnatching device, known as a Mortsafe, still in place on grave in the old Tullaroan Graveyard in Co. Kilkenny. The grisly history of the eighteenth and nineteenth-century Irish body snatchers and grave robbers makes for macabre reading. The awful body snatching trade can today be regarded as a dark glimpse into the conflicts thrown up during a period of rapid social and scientific advances. The dissection of cadavers is an age-old practice and has been taking place since the fourteenth century in some parts of the world. The first ever (recorded) dissection took place in Italy around the year 1300, and the first case of body snatching followed hot on its heels, taking place in 1319. Over the following centuries, dissection became a far more commonplace event amongst medical practitioners, leading to an increased demand for the dead bodies required for this form of study. At first, the bodies were most those of people who had been executed or those so poor that they would be need to be buried by the state, but latterly they began to be provided by grave robbers. The practice of body-snatching was fairly commonplace among students at medical colleges in particular, but over time a growing band of ‘Resurrection Men’ started to appear who made a living by stealing and selling on corpses. These unfeeling criminals were often cemetery workers or watchmen, as they had inside knowledge of where the recent dead had been buried. During the nineteenth century, a growing number of grave-robbing gangs started to operate in Ireland. In Dublin, the Royal College of Surgeons and a number of anatomy schools required huge numbers of corpses for the purpose of dissection. But available cadavers were in extremely short supply in the city – a fact that was exploited in the most unpleasant way by the body-snatching gangs. Gang members would sneak into the graveyards under cover of darkness and dig up the coffins using wooden shovels (because they were less noisy than standard metal ones). It was fairly easy to get to the bodies, as in those days graves tended to be on the shallow side. They would remove the bodies using ropes or hooks, place them in a sack and make their escape. This state of affairs led to a growing market in devices designed to protect the dead in their graves. Some relatives would set up complex booby traps over the grave of their family member which were designed to frighten off and even injure the grave robbers. Others organised night watches over the grave for the first two or three weeks after the death – long enough for the body to have decomposed to a state that it would no longer be a good specimen for dissertation. 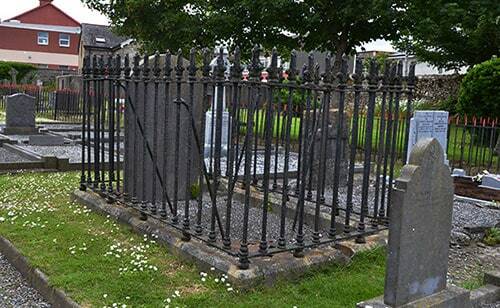 An Anti-bodysnatching grille protecting a grave in Corofin, Co. Clare. Body snatchers had a particular fondness for the huge Glasnevin cemetery in Dublin – so much so that the authorities built a wall to deter them and even installed a watchtower that could be moved around to be as near as possible to freshly dug graves. Desperate relatives mourning their nearest and dearest paid to have large stone slabs placed on top of graves, anti-theft grills around them or wrought-iron cages over them. 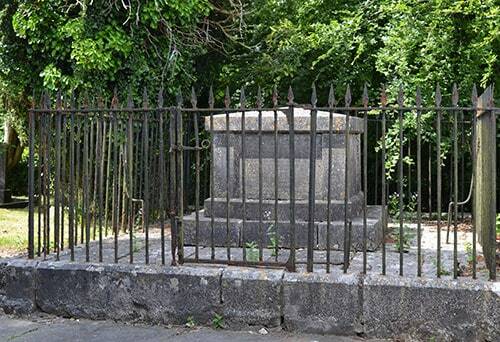 These were known as ‘mortsafes’ – an example of which can still be seen in the Tullaroan graveyard in County Kilkenny. Of course, these sort of grave defences were expensive, so they were generally only available to richer members of society. Another example of an Anti-bodysnatching grille, also known as a mortsafe. This one is located in the graveyard of St Mary’s Church of Ireland, Dungarvan, Co. Waterford. As grave robbers started to be deterred by these devices, body snatching became less common and the Resurrection Men fell on hard times. Then the hunt for corpses took a more sinister turn still. It’s a tale that introduces us to two of Ireland’s most infamous figures: Burke and Hare. They were living in Edinburgh when it occurred to them that a simpler way of obtaining a dead body to sell on would be to identify a likely victim before they had actually died. Hare ran a flophouse in central Edinburgh, and Burke was one of his tenants. One day, one of Hare’s lodgers dropped dead in the house, and Hare (who said that he was owed rent by the man) sold the body to one of Doctor Robert Knox’s medical colleges for a princely sum. Not long after, another lodger fell ill in the house, and this time the pair decided to hasten things on a little, smothering the helpless man as he lay in bed. Having acquired a taste for murder, there was now no stopping them. They would lure their victims back to the house by promising them alcohol, and there they would summarily smother them and sell the bodies on, all the while maintaining a pretence of being ordinary respectable citizens. Their murderous ways came to an abrupt end when they selected a victim who could hold her drink and insisted on socialising with some of Burke and Hare’s neighbours. Once the unfortunate woman had been finally dispatched, it was too late to remove the body, and they covered it with straw to hide it. When some of the merry-makers from the night before showed up for breakfast, Burke, convinced they would smell the odour of death, threw whiskey around to cover it. This made the visitors suspicious, and they discovered the body and called the police. Burke and Hare were subsequently tried and hanged. In total, they had murdered sixteen unfortunate souls. The ignoble body snatching profession and the awful fear felt by so many who became unwittingly involved with grave robbers only came to an end with the 1832 Anatomy Act. This act stated that only bodies from the workhouse that were left unclaimed could be used for the purpose of dissection in medical colleges and other authorised places, and thus the Resurrection Men faded into obscurity. Though the act was repealed in 1984 in the UK, it is still valid in Ireland.